We’re positively addicted to summer salsa on the farm. We like a nice head sweat when we chow down on it with chips, so we add loads of roasted peppers. 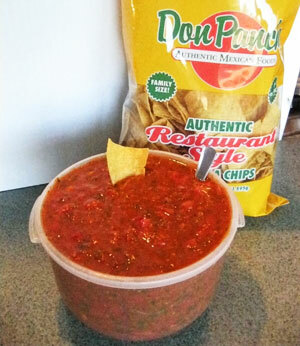 This recipes makes almost one full gallon of addictive salsa. Just half it if you want only a half-gallon. It’s the best! While the peppers are roasting, cut fresh tomatoes into bite-sized pieces. When the peppers are done, let them cool until they come to about room temperature. Next, mix the tomatoes and pepper sauce. Add cilantro and lime juice and zest.